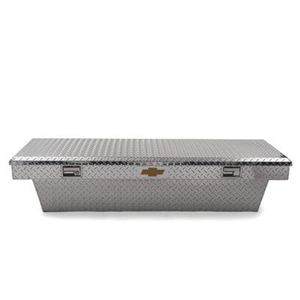 Constructed of 0.75mm diamond-patterned aluminum with a full-length stainless steel hinge and foam-filled lid that supports up to 500 lbs, this toolbox is built to last. No drilling required, mounts securely to the bed rails. Features the Chevy bowtie logo.